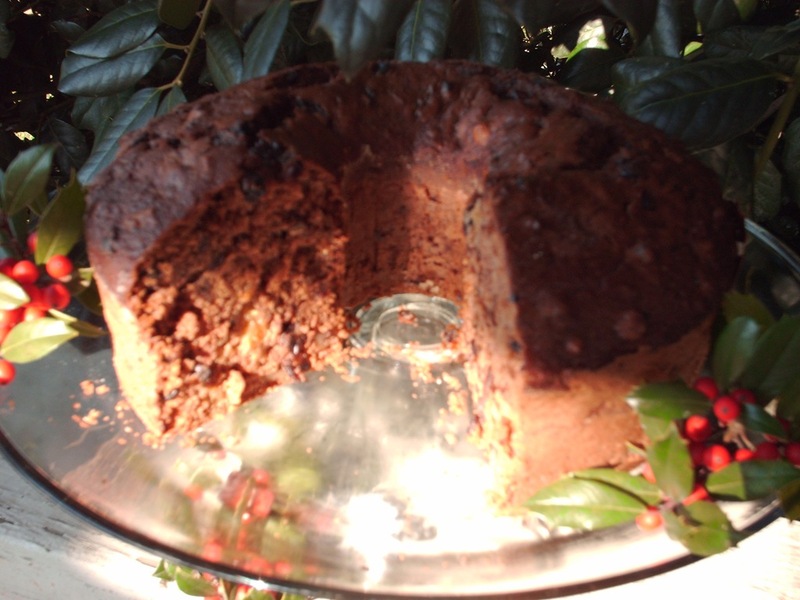 This is the time of the year that many people think of fruit cakes, our family for generations never really cared for fruit cake, with all the candied fruit and citron in them. 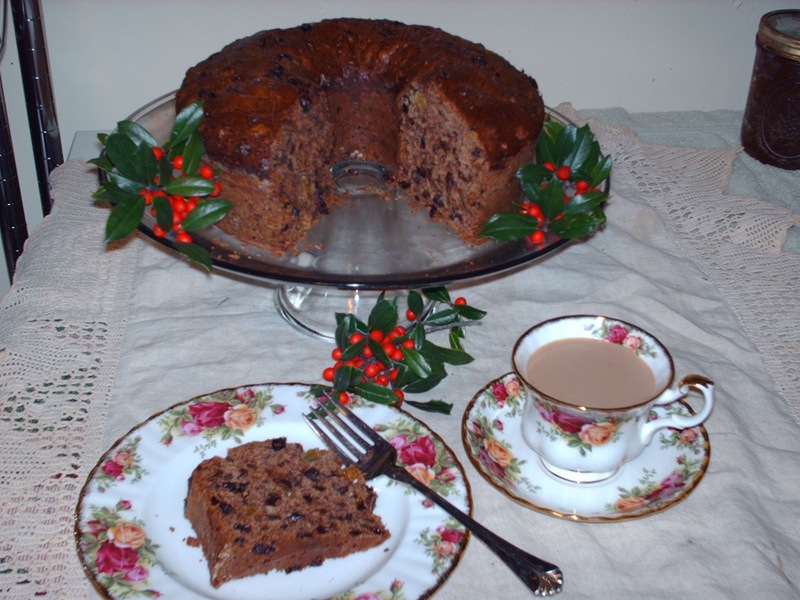 However that being said if we were given a fruit cake we would eat it and it was OK, but our family much more appreciated and looked forward to to the yearly applesauce cakes. Applesauce cakes are in may ways just another type of fruit cake, where the main ingredients are dried fruits (just not candied). Over the years I remember sitting down with mom, her favorite thing to do on a cold day was to pull out all the cookbooks (believe me there were plenty) and we would scour the books for all the applesauce cake recipes, many were the same, however we were looking for those little things that someone did differently that we had not thought of before. Many times we would look through old cookbooks in shops and the deciding factor was the applesauce cake recipes we found in them, We both liked to collect cookbooks 1950 and before, as those cookbooks were pretty much based on the staples most homes kept on hand at anyone given time. You pretty much knew that you could go to the cabinet or pantry and find everything you needed to make whatever you were wanting to make. 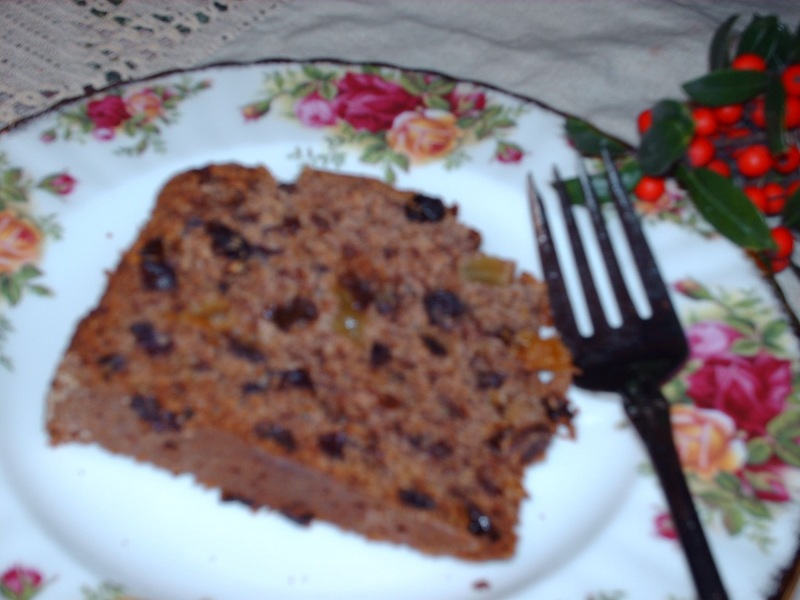 Applesauce cakes, like fruit cakes keep for a very long time. most of the time there would be two made at the same time. One to eat about a week after it was baked, and the other to be wrapped in towels, that had been soaked in some form of alcohol, to preserve them, like with fruit cakes, applesauce cakes get much better with age. Applesauce cakes can be as varied as the people who bake them, from just plain, to loaded with dried fruits. such as of course applesauce (at home if we had apples to can for applesauce we would use freshly made) also included would be raisins, currants, I like to soak dried sour cherries, sometimes apricots, basically you take a general recipe and add what you like in the way of dried fruits, today I imagine dried cranberries would be good. (though I have not tried this yet) of course nuts, spices etc. I did some looking online over the past several weeks and have been amazed at the numbers of recipes I have found for the applesauce cakes being made in sheet cake pans, this we never did, opting for the old faithful 9-10” tube pan (with the removable bottom and tube) This make a nice and majestic looking cake! Add dusted fruit and nut mixture. Bake at 350 degrees for 1 hour 15 minutes to 1 hour 30 minutes. Bake using the times given, check at about an hour to see if the center is done by inserting a knife, mine took the full 1 hour 30 minutes with the addition of the sour cherries. Carefully invert cake onto plate, then back onto cake plate so that cake will be right side up. If you want to preserve the baked applesauce cake, wrap in Linen (or other non fuzzy towels) and mist with Rum, Brandy, or alcohol of choice and keep in an airtight container, in years gone by we have kept applesauce cakes for up to 6 months, every now and then open the container check to see if towels are still moist, if not mist them well and return to airtight container and keep in a dark cool place until ready to eat. Over the past weekend I tried using my butternut squash in a wide variety of ways, from sweet to not sweet. 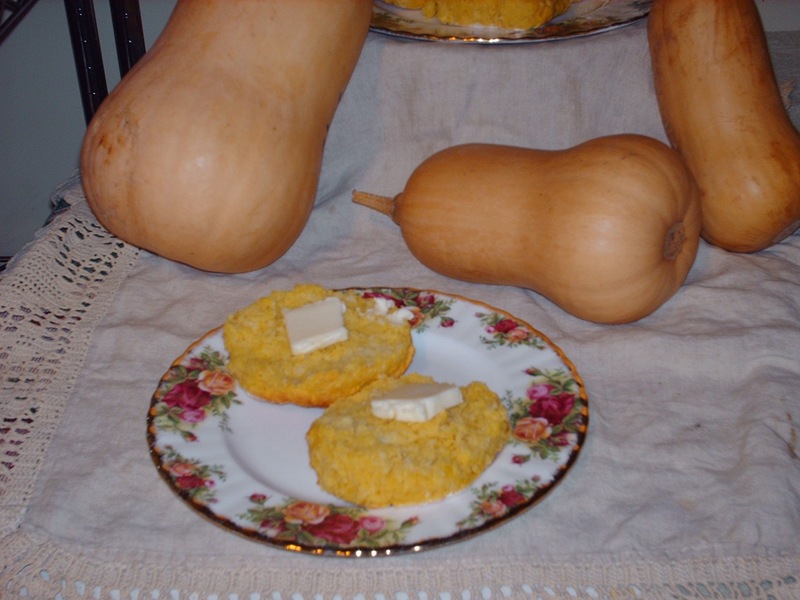 From a 4 1/2 pound butternut squash I made the following recipes. Savory Bacon Browned Butternut Squash Soup, which turned out very well. and the Butternut Squash Bread and then I had 1 cup of Butternut puree left and wanted some Sour Cream Biscuits so I did some experimentation with the last 3/4 cup. 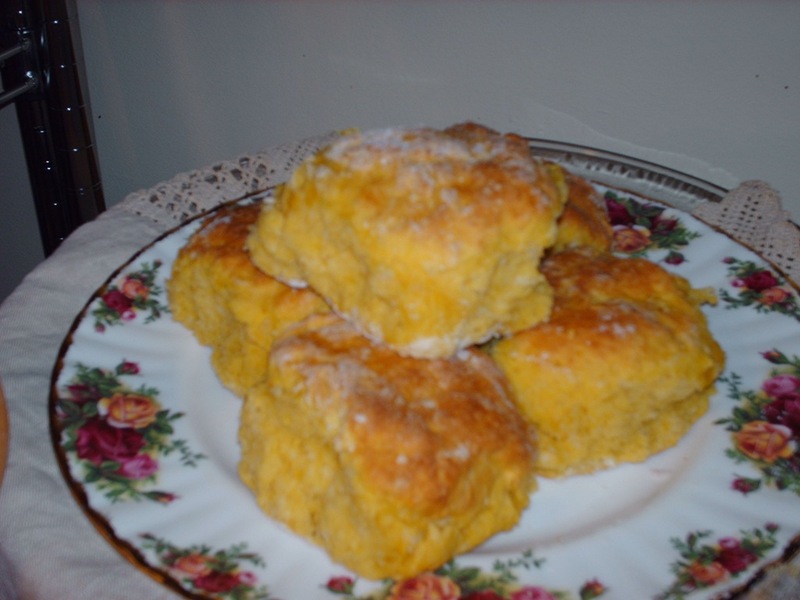 and this too was very successful indeed, I really cannot say that they had a butternut flavor, however it sure did give the biscuits a very buttery yellow color. When mixing biscuit dough you do not want to over work the dough, I use a Kitchen Aid with the flat paddle, I mix the dry ingredients in the bowl, then add the Sour Cream and Butternut that I have mixed by hand in a separate bowl,, mix with a pulsing motion add the butter, and finish with the 1/2&1/2, when adding the milk or 1/2 & 1/2 you want to add just enough to form a nice moist dough, then stop. I turn my dough out onto a lightly floured pastry cloth, then turn the dough over to coat lightly with flour, then pat out to about the thickness of a canning jar ring or biscuit cutter. then cut my biscuits and place on a parchment lined tray. For those of you that have never used parchment, I encourage you to give it a try, clean up is fast and easy, and the parchment can be used many times over. biscuits and cookies NEVER stick. I usually will get about 12 biscuits using the wide mouth canning jar ring. Preheat the oven to about 450, and bake for 12-15 minutes. Check to see if tops are golden, if not leave a couple more minutes but watch closely as it will only take an additional minute or two. 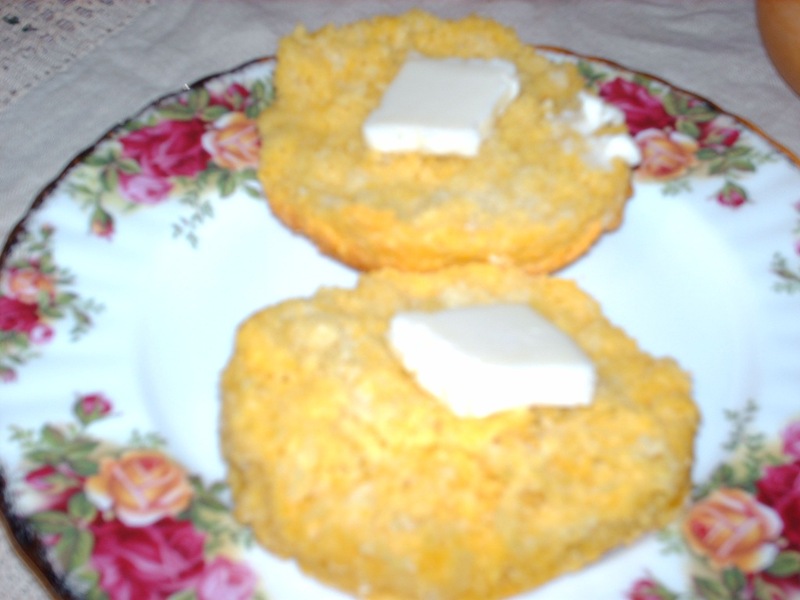 I remove mine from the oven and brush the tops with melted butter.